Perhaps there’s nothing wrong with this. Food and cooking are a big part of my life, and the main reason why I started a food blog was to share my love of them. I enjoy cooking up new recipes with the knowledge that I’ll get to post the pictures and babble about my cooking adventures in a forum where other people appreciate that kind of thing. Regardless, I still wonder about what else I could talk about before going on to do that babbling. 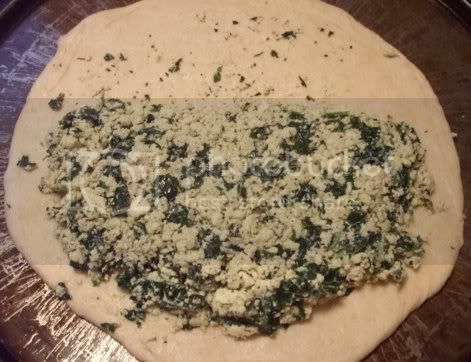 Vegan Planet has an awesome recipe for spinach and tofu calzones that I made once, a long time ago. 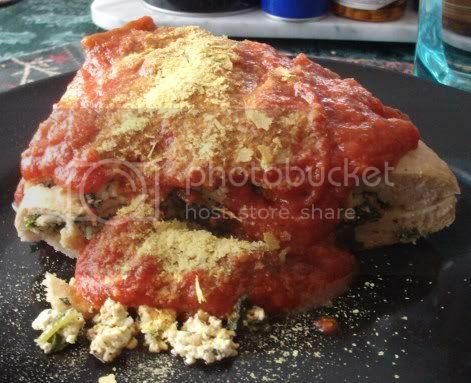 It involves pureeing spinach and silken tofu in a blender and mixing it with sauteed extra-firm tofu and galic, plus a little basil and oregano for an authentic Italian flavor. The result is a filling that is decidedly not vegan in appearance, and may even fool omnis into thinking it’s ricotta at first glance. I had no spinach on hand, so I used kale. Because kale is awesome and we have absolutely no shortage of it stocked up between what we grew this past season and the extra that a family friend gave us from her garden. Kale is so awesome, in fact, that I’m thinking of substituting it in place of spinach in other recipes. I’m not sure which recipes yet, but the next time I run across spinach on an ingredient list, I’m reaching for the kale. These were amazing with some Newman’s pasta sauce and nutritional yeast on top. I used a little less than half a recipe of Basic Pizza Dough from 1,000 Vegan Recipes and let it rise in front of our wood stove–best place ever to raise dough. It turned out crispy on the outside and fluffy on the inside, just like pizza or calzone dough should. I wish I’d had some spelt flour on hand; spelt dough would have been great for these! Question for the comments: Do you like reading a few personal details in blog posts, or do you prefer straight-up food blogging? 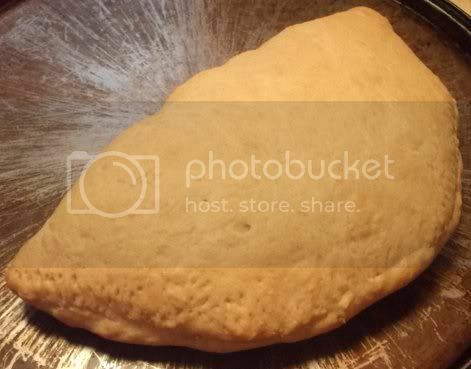 Yum, those calzones look awesome!